Wisconsin has won five of its last eight games with Michigan, which leads the overall series 50-15-1. All offseason, people looked at Michigan’s first six games of the season and figured it would post a 5-1 or 6-0 mark, given the only real test was the opener at Notre Dame. The Wolverines couldn’t get it done against the Fighting Irish, but have reeled off five straight wins and now enter what figures to be their season-defining stretch — starting with a home contest against No. 15 Wisconsin at Michigan Stadium. Following the game against the Badgers, Michigan will play at rival Michigan State before hosting No. 8 Penn State on Nov. 3. Michigan comes in full of confidence, having blown out Maryland, 42-21, to win its fifth straight. Skeptics will point out that beating Western Michigan, SMU, Nebraska, Northwestern and Maryland isn’t much of a reason to jump for joy, but Wisconsin will provide a great measuring stick of how much Michigan has improved since the season-opening loss at Notre Dame. Michigan enters with the nation’s No. 1-ranked defense in total yards allowed, but knows that Wisconsin’s pounding ground game led by running back Jonathan Taylor poses a challenge it hasn’t this year. Taylor has already rushed for 849 yards and eight touchdowns on 126 carries this season as he rapidly approaches the 1,000-yard plateau. Wisconsin enters on a two-game winning streak following a disheartening 24-21 home loss to BYU on Sept. 15 that many feel already cost the Badgers a shot at making the College Football Playoff. But following a gut-check road win at Iowa on Sept. 22, beating a ranked squad like Michigan on the road would be a big step toward restoring Wisconsin’s status as a playoff contender. Wisconsin junior quarterback Alex Hornibrook, who has completed 64 percent of his passes (73 of 114) for 963 yards and seven touchdowns, is also a passing threat to complement Taylor, but Chryst knows it will be a whole different challenge facing Michigan’s defense. 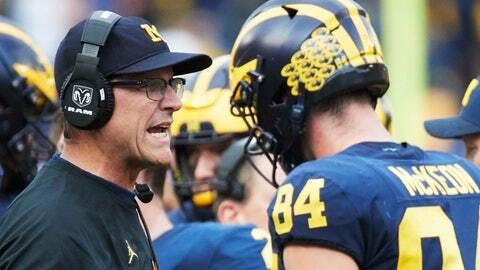 When Michigan has the ball, it will be a matchup of a surging Wolverines offense against what’s been a vulnerable Wisconsin defense. Michigan transfer quarterback Shea Patterson has been everything the Wolverines have hoped for so far, completing 68.8 percent of his passes (95 of 138) and throwing 10 touchdown strikes, already more than the Wolverines had all year. Senior running back Karan Higdon has rushed for 582 yards on 101 carries behind an improved offensive line. Meanwhile, Wisconsin has struggled to defend the pass and develop a pass rush. The Badgers are allowing an average of 220 yards passing per game and have only five sacks on the season, three of which came last week against Nebraska. Wisconsin will also be without starting free safety Scott Nelson in the first half after he was called for a targeting penalty against Nebraska. Sophomore Eric Burrell will start in his place. After not playing each other for five straight years, Saturday will mark the third year in a row the Badgers and Wolverines will hook up. Michigan recorded a 14-7 win two years ago in Ann Arbor, but Wisconsin earned some payback at home last year with a 24-10 victory in Madison, Wis.